MOSCOW, July 1. /TASS/. 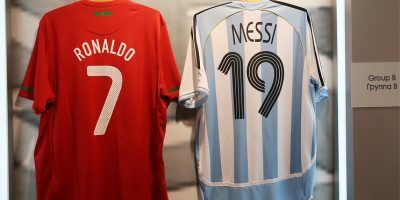 Saturday, Day 17 of the 2018 FIFA World Cup was the last tournament day for the world?s two biggest football stars of our generation – Lionel Messi and Cristiano Ronaldo. In the two Round of 16 games on Saturday, Argentina lost to France, and Uruguay sent Portugal packing. France have edged past Argentina 4-3 in the Russian city of Kazan and made it to the quarter-finals in the game, described as one of the tournament?s most interesting events. Antoine Griezmann (13′ PK), Benjamin Pavard (57′) and Kylian Mbappe (64′, 68′) scored for France. Sergio Aguero (90′ +3), Angel Di Maria (41′) and Gabriel Mercado (48′) planted the ball in the net for Argentina. Kylian Mbappe announced himself on football’s biggest stage after netting two goals for France. His performance sparked comparisons with Pele, as the 19-year-old became the first teenager to score two in a World Cup match since Pele?s 1958 double in the Brazil-Sweden final. Hours after the tournament was over for Messi, Ronaldo was also knocked out of the World Cup in the game against Uruguay. Portugal was eliminated out of the 2018 FIFA World Cup with a 1-2 defeat. Pepe scored for Portugal in the 55th minute. A brace from Edinson Cavani (in the 7th and 62nd minutes) secured Uruguay a place in the World Cup quarter. Cavani, however, had to leave the field due to injury. The coaching staff is yet to comment on how serious his injury is. “So far, I had no chance to talk to medics,” Tabarez said at the post-match news conference. Securing a place in the quarterfinals, Uruguay will take on France in Nizhny Novgorod on July 6. The match will start at 17.00 Moscow Time. Another quarterfinal will be determined on Sunday, as Russia will take on Spain (17:00 Moscow time, Luzhniki Stadium, Moscow) and Croatia-Denmark (21:00 Moscow time, Nizhny Novgorod). Commenting on the results of the day, Local Organizing Committee (LOC) Chairman Arkady Dvorkovich said that although Messi and Ronaldo were knocked out, other players demonstrated great potential. “Something will be lost, but something will be gained. Good thing that it happened on the same day,” he said, when asked whether the exit of Messi and Ronaldo may ruin the World Cup. “On the other hand, Mbappe, Cavani and Suarez were incredible today.”.